Console table, having a D-shaped top of Carrara marble, on giltwood base, its apron outcarved with an evolute scroll, centered by a framed scallop shell, raised on round, tapering, stop-fluted legs, ending in touipe feet. CONDITION: Excellent condition. Minor wear consistent with age and use. Minor scratches and wear to marble. 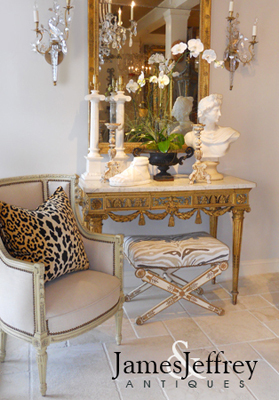 Console table, having a D-shaped top of Carrara marble, on giltwood base, its apron outcarved with an evolute scroll, centered by a framed scallop shell, raised on round, tapering, stop-fluted legs, ending in touipe feet. CONDITION: Excellent condition. Minor wear consistent with age and use. Minor scratches and wear to marble.